As we slipped away from Melbourne the morning of February 8th aboard the “Spirit of Tasmania” I got a plaintive text message from my daughter–“please take the chocolate with you.” My penchant for Cadbury’s dark chocolate with almonds has not made this blog to date, but there it is. She needn’t have worried that I would leave it behind. Since our only packing restriction was the size of the Subaru, we were equipped for an expedition to the Antarctic. Even in summer, Tasmania can require everything from ponchos to mittens. We had camping gear, hiking clothes, paddling gear, city clothes etc. The only significant item item of clothing for which I felt no need was my tux. I saw our first vacation to Tasmania as an exploratory visit. We had bookings for the first three nights only. The accommodation our first night got blown away when circumstances required us to let our departure slip back one day. By that point, every place in the arrival port of Devenport was booked. Not to worry. We still had our booking at a cottage near Cradle Mountain. It would mean driving up there as the light was fading. though, and I didn’t realize what that meant. If you’ve seen a video game where creatures are constantly popping up in front of you while you are trying to negotiate your way up a narrow, winding road, you can imagine the drive. Most of Tasmania’s critters are nocturnal, and they seemed to like nothing better than testing my night vision and reflexes. But the next two days made up for it. 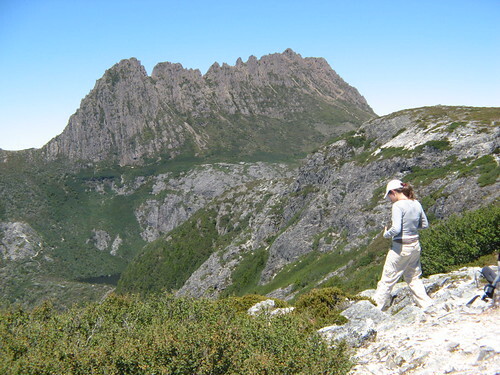 Cradle Mountain is one of the most spectacular areas of Tassie, and the island is blessed with beautiful scenery. There are only about thirty days of sunshine per year and we got two of them. We circled Dove Lake, scrambled up to Marions Lookout, met a curious wallaby and a couple from Newfoundland. I had a rough idea of what we might be able to see during the following ten days but we didn’t come close. It is a matter of topography. Tasmania is an island like Sardinia where practically nothing is flat. We did a lot of driving and seemed to get not very far. The most spectacular place we came across was a spur of the moment choice, thirteen kilometers up a gravel logging road. It was a stunning, precipitous look off called Devils Gullet, not too far (as the crow flies) from Cradle Mountain. I’m afraid my photos do not do it justice. The vertiginous view from a scary metal perch over the edge of a sheer drop rivals that of the Grand Canyon. From Devils Gullet, we dropped down to a little patch of paradise in the Tamar Valley, the Pearwalk Cottages. It was another fortuitous find. We had been referred to it by the owner of a Bed and Breakfast nearby that was fully booked. It was so lovely that we went back the night before we left. Mostly, we stayed in what the Australians call “cottages,” self-sufficient units with bath and kitchen. Two of them were in popular destinations. They were modern and classy with prices to match. One place we stayed was a dump. We stayed in a bed and breakfast that had been been built by convicts and housed the workers under lock and key in the basement. One night we camped out and listened to the gulls. During our too brief stay we tasted some fine Pinot Noir at several lovely wineries in the Tamar Valley; we strolled for hours on a white sand beach in the Bay of Fires; we hiked up and over boulders to see Wineglass Bay; we paddled among dolphins in Freycinet National Park; we visited two historic bridges, two lighthouses, one mansion and the National Rose Garden. But there is so much more. We haven’t seen Hobart or the Tasman Peninsula or Bruny Island or the West coast or Lake St. Clair. We’ll be back. Tassie’s alluring, addicting, just like chocolate. Did I mention the Cadbury Factory? Next time, I can leave my stash behind and live off the land. Fine wine, bread and chocolate. What more can you ask for? Two weeks ago I got a lobotomy. Don’t let anyone tell you the brain doesn’t have nerve endings. It was (still is) very, very painful. It all began with my vision of peripherals not working. I would wheedle, I would cajole, I would uninstall and re-install. No matter what I did, nothing would get the mother ship to accept its acolytes. A scanner, a webcam, a sweet little device called a Squeezebox that allows music on the computer to be played through the stereo. My short, squat computer refused them all. So, the question began niggling at me. What to do? Computer problems have a way of messing with your mind. If only, you say to yourself. If only it would work the way it should. Reformat is such a harmless sounding word. Our very first lobotomy happened entirely by accident. It was in Hong Kong shortly after the handover from Dos to Windows. I know, I’m dating myself. Despite its reputation as a great place to buy electronics, the IBM laptop we purchased was a major investment. It was the software that was cheap. Something about not paying royalties. Sure enough, six months later there were serious issues. I took it back to the shop and told the owner about the problem. He smiled at me, took it under his arm and said: “reformat. ok?” I had no idea what he was talking about. It did not dawn on me that he was talking icepick. That I would be picking up a reamed-out brick instead of the clever little crutch that I had come to depend on for everyday life. The very word ‘reformat’ gives me heart palpitations. But time heals, as they say. We forget. Twelve years is a long time. I have everything backed up. It is simply a question of reinstalling my programs and the data. That’s what my rational, intelligent mind had to say. My body got the night sweats. Big brain won. I lost. All my contacts, appointments, email. Everything My computer guru did the same thing I did to reinstall Outlook data file. He tried. He failed. If you are reading this I may have had your address in my files once upon a time. Not any more. No worries. Someday, someone will figure it out. In the meantime, enjoy the peace and quiet of my absence. Pretend I’m on Mars. I won’t be bugging you anytime soon. Check back here in a few days. We just returned from nine days down under down under. That’s right, Tasmania. Words and pics will be up as soon as I get the bills paid and a pile of laundry done. It was a day like any other day, only yesterday was my 63rd birthday so I could have expected perfection. On birthdays you ask your loving ones to reward you for having squirmed out of your mother’s uterus demanding air, food and attention, all at once. My wife wished a happy birthday on me before the coffee was done brewing. My daughter left for work before we were up, but there was a lovely card on the dining room table. The natural health food food store remembered me. Isn’t that something? It wasn’t my birthday in North America yet, so I couldn’t expect friends and family there to adjust their mental calendars and send their wishes in advance, but I was a bit miffed all the same when my inbox turned up empty. It was a year ago exactly that we moved into our digs here in Essendon. For a month or more I had my work cut out for me arranging furniture, hanging pictures and getting things put away, dealing with detritus, 62 years of accumulating stuff. If you are distressed by mess and want to be able to find things again, then tidying up is a never-ending process. Last week I tackled the garage. Yesterday, the tiny, windowless office I call my own consumed much of the day. It made me think of tidy towns. From what little I could find on the web, it seems to be a concept that originated in Ireland, but it has taken hold in small towns here in a big way. The very idea seems to contradict the notion I have of Australia as an outlaw, outback country where Mad Max is cruising along waiting for some evil creature to pop his head up. To my way of thinking, tidy towns are imbued with artificiality, like Disneyland. But they seem to have taken off in the mother country as well. The screenplay for “Hot Fuzz” took this idea and ran with it, to hilarious effect. Seaside, Florida is a real town on the Gulf coast designed around the tidy town ideal. No one actually lives there. Each home is a summer getaway with an owner’s plaque on the outside indicating the family members, including pets, and where they live their “real” lives, when they are not in Seaside. The only part of my birthday that I had planned ahead of time was dinner with my wife and a friend down in St. Kilda and a evening with a fifty year-old lefty by the name of Billy Bragg. Dinner was delightful. When we showed up for the show,however, a small sign indicated Billy would not be performing until 10:30. Most nights, that’s my bedtime. He was the headliner so it was his prerogative, I suppose, but the tickets said 8 PM. We grumbled a bit. My wife had a busy day planned so she bailed out and caught the tram home. I’m not a great salesman, so I flogged her ticket for a fraction of its cost. Geoff and I went inside. It was a ballroom. Pricey beer and no seats. True to his word, Billy came on at 10:30. Fortunately, the two musical acts during the two and a half hours prior to his appearance were first rate. Billy sang some songs everyone knew as well as some new ones from an upcoming CD. He told some jokes and anecdotes and preached to the converted at some length toward the end of the set. He called us his brothers and sisters and urged us to be activists and not get cynical. It wasn’t tidy, the perfect ending of a perfect day. It wasn’t the Truman Show, but it wasn’t Hollywooden either. It was messy, uncomfortable and unexpected, just like real life.